I’ve started it. I’m 65 pages in. It’s great. Help! 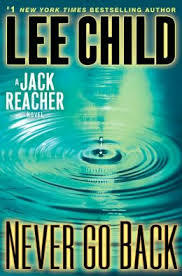 It is Lee Child’s latest Jack Reacher thriller, Never Go Back. As I mentioned two days ago, I don’t want the book to get in the way of our vacation. I don’t want to be Lee Child’s prisoner for the next 24 hours. Today is our first full day in Nantucket. I want to walk. Go into town. Eat. I can’t just sit and read. At least I slept last night. The book arrived on my Kindle shortly after midnight. If we were still in Seattle, I might have started it before bedtime and never gone to sleep.